We regularly hear politicians saying diplomacy plays a direct role in addressing the root cause of insecurity and that good diplomatic initiatives help to build partnerships so that Sri Lanka can work together with the world to address some of our thorny bilateral and multilateral issues. To play that role effectively, they also say Sri Lanka needs competent officials. But despite that, we still post officials to important markets with no experience whatsoever. Sri Lankan diaspora living in a Western capital were shocked recently to see their envoy not knowing that the Ambassador/High Commissioner was the primary representative for all Sri Lankan interests in that country, and that varies from being responsible for taking care of Sri Lankan citizens and their needs to the issuance of visas, to the discussions about political and economic and trade and commerce issues, also the military relationships and dealing with the environment. It’s technically the whole range of things. In addition they must also do public diplomacy, they are expected to give effective speeches at different sorts of events to make sure that people in that country are well aware what our policies are and why we have them. There are really two ways to get appointed as an Ambassador or a High Commissioner for Sri Lanka. Either through the Foreign Service process where you join as a junior officer and you work your way up through the system and about two-third of the ambassadors go through that route. For that, you begin by taking a written test. And then if you pass that test and get in, you work your way up through the system. The other way for becoming an ambassador is that the Government always chooses a number of ambassadors from its own lists without the Foreign Ministry connection, and that’s based upon people who have assisted the effort to get the president or government elected one way or another, or competent people who are well-known to people in the government and they figure that they would do a really good job even though they haven’t gone through the system. Some ambassadors have the good fortune to know or be related to somebody who gets elected as president, like in the previous regime when two brothers got posted to the US and Ukraine at the same time. As the JVP has said many times in public, diplomacy is serious business. It refers to communication or negotiations tactics that use political and legal channels to address both bilateral and multilateral issues. Good diplomacy works in at least four ways a) to protect a nation’s security, b) to stop potential threats from becoming real, c) to secure a nation’s economic future and d) to protect the global environment. Therefore, members of the Foreign Service play a crucial role in making the kind of lucrative international connections/agreement possible to help a country to look good and in the pursuit of economic objectives. 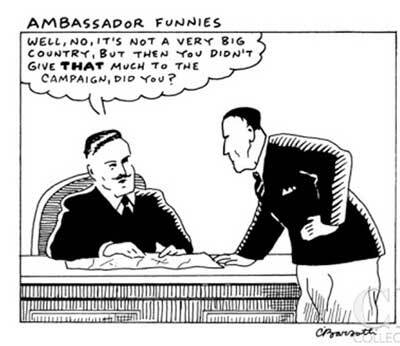 Diplomacy used to be thought of as the quiet, behind-the-scenes, government-to-government communications. It’s now so much more than that. Therefore for a country to promote the kinds of economic and trade policies they want around the region and the world, a country needs to appoint competent people to build a public case internationally for their policies, for their values and for their interests. This will then enable a nation to become a credible and trusted partner, while remaining devoted to their national interests and also promote their economic ties at the same time. Therefore the officials appointed to promote Sri Lankan interests abroad should as far as possible be people who have the skill to focus on economic and political diplomacy to secure our core national interest. That would require for the service to have a mix of top quality non-career and career diplomats with good academic pedigrees and technocratic mettle and with character, integrity and helicopter quality to drive our political and economic agenda. Therefore, given the economic and socio political shift, the technology disruption that has occurred in the international scene and the need for active international engagement, which is basically leveraged upon the pursuit of economic objectives, promoting good diplomacy can increase our ability to play a constructive role in building a more peaceful, prosperous region, for us and others. To do that, our reps need to be skilled, politically effective and trusted, enabling them to accomplish goals that the country so desires.